Summarising the Brussilow offensive is no easy task. For my purposes I have simply concentrated on the actions of the Heeresgruppe Linsingen between the Styr and Stochod and the defensive battle at Kowel (click HERE) as these are the actions most often found on Iron Cross documents and in the Militärpaß. A map of the area in which the German troops at Kowel fought can be found at the bottom of the page. Links to Iron Cross documents and descriptions of the fighting are to be found at the bottom of the page. A map showing the full length of the Brussilow offensive in the opening stages can be found HERE. A map of the offensive in its closing stages can be found HERE. In May 1916, the troops of the Entente were heavily engaged. On the Western front the fighting at Verdun was raging, in the Tyrol the Austro-Hungarians had thrown their best units against the Italians and trouble was brewing on the Somme. The Austrians had withdrawn their quality troops from the Eastern front to the Italian front without informing the Germans and now the allies, especially the Italian Govt were appealing to the Russian Tsar Nicholas II to launch an offensive to draw in German and Austro Hungarian reserves from their respective fronts. The Tsar, as he had done in 1914 and 1915, did his best to accommodate. The Russian high command however, complained that they lacked men and material for such an offensive. Only General Brussilow declared himself willing to undertake an offensive at short notice. Brussilow knew he could not rely on the support of his fellow Generals, he lacked both artillery and men and any success would be due to his leadership and planning, not to any material advantage. The powerful "Brussilow" offensive would hit the Entente at a weak spots on the eastern front, in a wide area stretching from the southern part of the Pripjet swamps down to Bukowina. 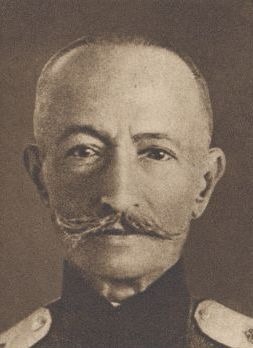 Brussilow believed that by attacking at numerous places on this front he could keep the enemy off balance, never sure where to send their reserves. The Russians would send four armies against a weak Austro-Hungarian front strengthened by a handful of German divisions in the North (part of the Heeresgruppe Linsingen). The German troops were small in numbers, and it was considered doubtful that they could stop the massive Russian Offensive. In the end the Germans were good for a big surprise, they were able to stabilise the front and shore up their tottering allies. The offensive started on the 4th of June 1916 (Later to be known as “The glorious 4th of June” by the Russians) after a short and heavy barrage. Sending shock troops out in front, followed by larger bodies of men, Brussilow used a crude version of the assault tactics that the Germans would soon perfect. The Austrian 4th and 7th armies were swept away and within a week the Russians had forced a bulge in the lines of the Central Powers that measured 100 km in width and 40 km in depth. If the German 108th Division (at Luck) and General v. Bernhardi's 92nd Division with the Garde-Ulanen-Briagde (on the Sierna river) had not stood their ground the Russians would have swept into Kowel (an important Railway hub) and Wladimir-Wolynsk. To the South the Russians were swallowing a large portion of Bukovina and the Austrians were close to suffering a disastrous defeat. The Austrians desperately recalled units from the Italian front and a furious Falkenhayn was forced to send reserves earmarked for Verdun to the eastern front. The initial success of the attack came as such a surprise to the Russians that they missed a large opportunity. Their reserves had been kept to far back and they were not able to exploit their breakthrough as well as they could have. Added to that other Russian Generals, maybe due to jealousy over Brussilows success, refused to launch already planned diversionary attacks to the North of the Prijpet swamp to draw off more German troops. In fact, the inactivity of these Generals allowed the Germans to send troops in those sectors to the South to join those coming from the West. Days passed as Brussilow prepared his troops in front of the German positions for a new assault. All the while the German reserves were flooding to the front. With his newly arrived troops General Linsingen planned a counter attack to squeeze out the newly created “Lucker Bogen” (Luck salient named after the town Luck). It was meant to be a major blow to the Russians and “to teach them that they should stay in their trenches" (a direct quote from the Prussian War Minister). The counter attack coincided with Brussilows new push on which started on the 14th of June. 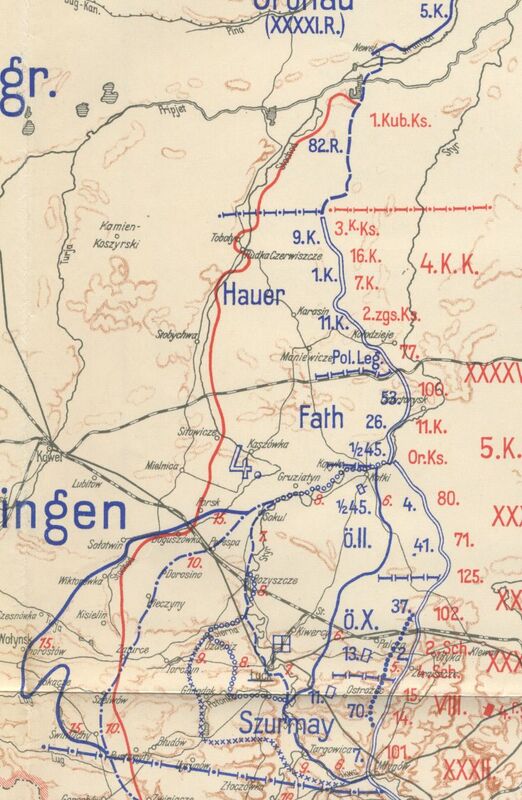 Heeresgruppe Linsingen attacked on the 16th and the two assaults met head on. For the rest of the month of June both sides fought furiously pushing each other backwards and forwards over the battle ground between the Styr and Stochod rivers. In v. Bernhardi's sector where the Division Rusche was fighting (Later became 92. I.D.) a Russian breakthrough seemed eminent, but the arrival of the 107. I.D. and the 11. b.I.D. strengthened the front. New Divisions under v.d. Marwitz then arrived on the front, and the 43. R.D. began to methodically break through the Russian defensive lines reaching the area of Kisielin. Upon the arrival of the 22 I.D. v.d. Marwitz began a new push attacking southwards as well. On the 1st July German attacks pushed the Russians back between the Lipa and Polionka rivers. In the meantime the Russian right flank had strengthened and heavy fighting took place on the Styr and Stochod lines once again. Above: A map showing the main sector mentioned in the text.